This study was aimed to determinate the yield and quality pattern of alfalfa stand under different intercropping treatments. Alfalfa was intercropped with sorghum-sudangrass hybrid, soybean, cowpea, and buckwheat at seed ratio of 100%:100%, 100%:80% or 100%:60%, and 100% alfalfa was used as control. 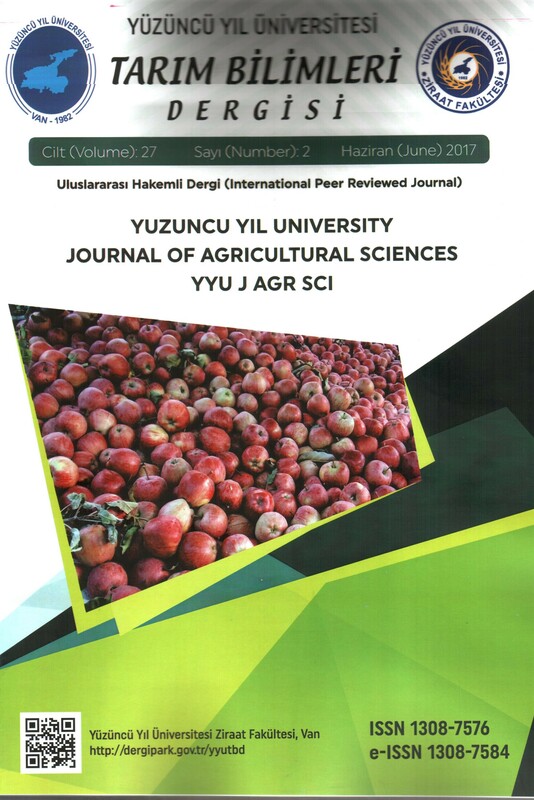 The experiment was arranged in randomized block design with three replications and conducted at the research field of Yozgat Bozok University located in inner Anatolia, Yozgat-Turkey. Alfalfa and companion crops were sown as binary mixtures with 60 cm row distance in the spring of 2015. All the data was collected in the establishment year and the first production year (2016). Hay yield, protein yield, ADF (Acid detergent fiber), NDF (neutral detergent fiber), Ca, Mg, P and K content were investigated in all the treatments. Alfalfa intercropped sorghum-sudangrass hybrid at 100%:60% seed ratio produced the highest hay yield both in the establishment year (18.25 t ha-1) and the first production year (17.91 t ha-1). This study showed that intercropping increased hay and protein yield of alfalfa stand compare to sole alfalfa with the significant effect of companion crop and seed ratio. Bu çalışmada farklı bitkiler ile karışık ekilen yoncanın verim ve kalite özelliklerinin belirlenmesi amaçlanmıştır. Yonca ile birlikte karışık olarak; sorgumxsudanotu melezi, soya, börülce ve karabuğday kullanılmıştır. Karışımlar % 100:100, % 100:80 veya % 100:60 tohum oranlarıyla ekilmiş, kontrol olarak ise yalın yonca kullanılmıştır. Çalışma Tesadüf Blokları Deneme Desenine göre 3 tekrarlamalı olarak kurulmuş olup, Yozgat Bozok Üniversitesi Uygulama ve Araştırma arazisinde yürütülmüştür. Yonca ile arkadaş bitkilerin ekimi sıra arası 60 cm olacak şekilde ve 2015 ilkbahar döneminde yapılmıştır. Çalışmada tüm gözlemler hem denemenin kurulduğu yılda hem de ikinci yılda alınmıştır. Araştırmada tüm işlemlerde kuru ot verimi, protein verimi ile ADF, NDF, Ca, Mg, P ve K içerikleri incelenmiştir. En yüksek kuru ot verimi hem denemenin kurulduğu ilk yıl (18.25 t/ha) hem de ikinci yılda (17.91 t/ha) yonca + sorgumxsudanotu melezinin % 100:60 karışımından elde edilmiştir. Bu çalışmada karışık ekimin yalın yonca ekimine oranla ot ve protein verimini yükselttiği ve yoncanın arkadaş bitkiden ve karışım oranlarından etkilendiği belirlenmiştir. Basaran U, Gulumser E, Dogrusoz M.C, Mut H (2014). The effects of turnip (Brassica rapa L. var. rapa) as a companion crop on alfalfa yield and quality. Forage resources and ecosystem services and Mediterranean grasslands and rangelands. Options Mediterraneennes. 24–26 June, France, pp: 119–122. Fen´andez-Aparicioa M, Sillerob JC and Rubiales D (2007). Intercropping with cereals reduces infection by Orobanche crenata in legumes. Crop Prot 26: 1166–1172. Goenaga R, Gillaspie Jr AG and Quiles A (2010). Field screening of cowpea genotypes for alkaline soil tolerance. Hort Science. 45: 1639-1642. Lanini WT, Orlof SB, Vargas RN, Orr JP, Marble VL and Grattan SR (1991). Oat companion crop seeding rate effect on alfalfa establishment. yield and weed control. Agronomy Journal. 83: 330-333. Miller DA and Stritzke JF (1995). Forage establishment and weed management. In Forages Vol. I: An Introduction to Grassland Agriculture. (Eds. R.F., Barnes. D.A., Miller and C.J. Nelson). Iowa State Univ. Press. Ames. Iowa. pp. 89-104. NRC (1996). Nutrient requirements of beef cattle. 7th ed. Natl. Acad. Press. Washington. D.C. Ren LX, Su SM, Yang XM, Xu YC, Huang QW and Shen QR. (2008) Intercropping with aerobic rice suppressed Fusarium wilt in watermelon. Soil Biol Biochem. 40: 834–844. Rogovska NP, Blackmer AM, Mallarino AP (2007). Relationships between soybean yield, soil pH, and soil carbonate concentration. Soil Sci. Soc. Am. J. 71:1251–1256. Schnurra J, Jungb H and Samaca D (2007). A comparative study of alfalfa and Medicago truncatula stem traits: morphology, chemical composition, and ruminal digestibility. Crop Sci. 47:1672–1680. Sheaffer CC, Martinson KM, Wyse DL, Moncada KM (2014). Companion Crops for Organic Alfalfa Establishment. Agron. J. 106:309-314. Tan M and Serin Y (2004). Is the Companion Crop Harmless to Alfalfa Establishment in the Highlands of East Anatolia. J ournal of Agronomy and Crop Science. 190 (1): 1–5. Undersander D, Cosgrove D, Cullen E, Grau C, Rice ME, Renz M., Sheaffer C, Shewmaker G and Sulc M (2011). Alfalfa management guide, ASA-CSSA-SSSA, Madison. WI. Whitmore AP and Schröder JJ (2007). Intercropping reduces nitrate leaching from under field crops without loss of yield: a modelling study. Eur J Agron. 27: 81–88.